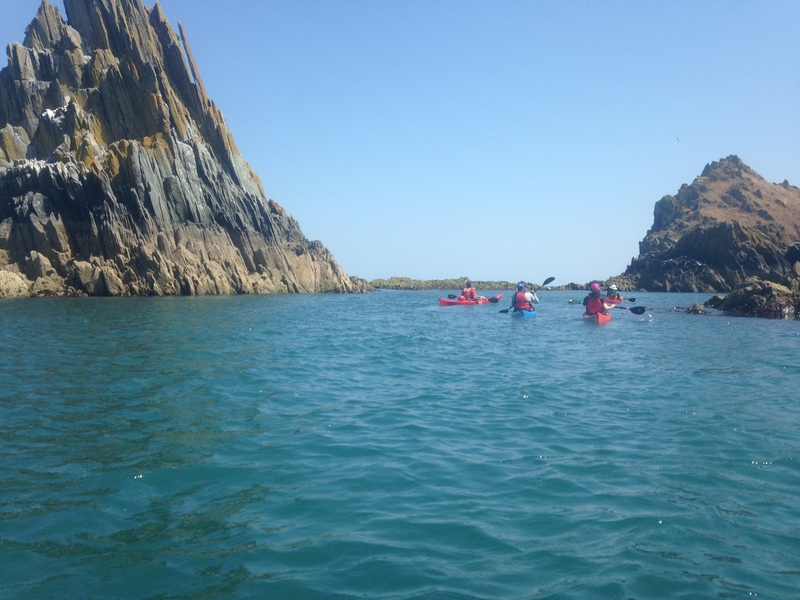 CKC returned to Dartmouth at the end of June & had two fabulous days of paddling. Tim, Richard H, Philippe, Phillipa, Fiona & visiting Danish paddler Jakob arrived Thurs eve at Sea View Campsite Devon. Jakob has kindly helped host CKC trips to Denmark in previous years. This year the campsite had left part of the campsite grass un-cut to enable birds to nest. So we were treated to the song of larks hovering above us. Friday 29 June – Phil, a local Dartmouth paddler accompanied us. First we took Jakob past Dartmouth’s mermaid statue, before heading out to sea. We then paddled out to Mew Stone rocks, where seals were lounging on rocks, or following us curiously as we paddled through the rocks. We returned to the estuary, stopped for lunch on the east side; before crossing the channel and paddling to Blackpool (Devon!) beach with the flow. We persevered up the shingle beach up to the café, spurred on by tales of how delicious the ice cream was! At the café we found ourselves – dressed in wetsuit shorts, helmet (forgotten to take off) – mingling with wedding guests who were looking stunning (despite perspiring) – it felt quite incongruous. We managed a tiny bit of frisbee on the shingle beach – but struggled with the gradient of the beach! On our return paddle we rock-hopped back & found the passage behind some very tall rocks, which enabled us to take short-cut back into Dartmouth. Saturday 30 June – we headed across the upper Dartmouth ferry, to Brixham, with David, a local paddler to do a one way paddle. 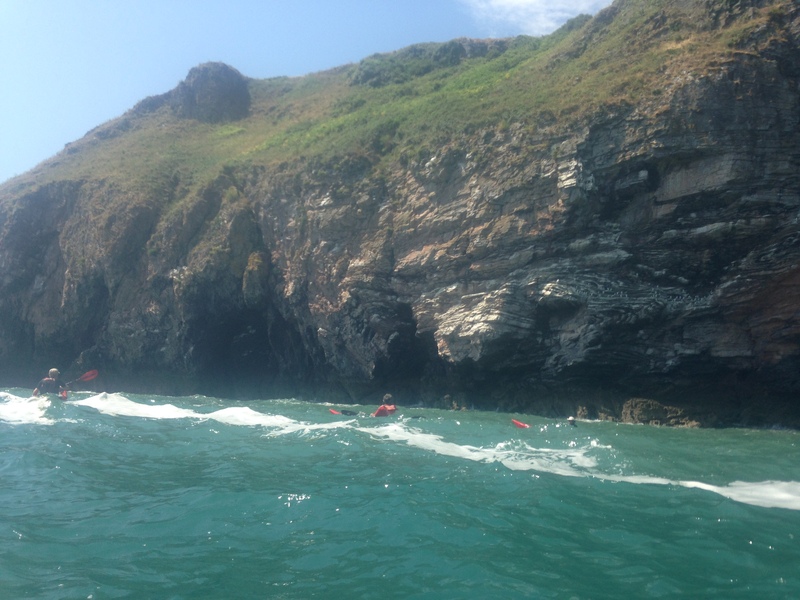 We launched from the small beach east of Brixham’s breakwater. The paddle from Brixham out & round Berry head was lumpy, and then the sea state reduced for the rest of our paddle. We paddled underneath the largest guillemot colony on the south coast on the north side of Sharkham point. It was fabulous to watch the striking white & black guillemots come & go. Despite the mixed gender of our group we landed (avoiding surfers & swimmers) and had lunch at Man Sands! Before Mew Stone rocks we split into two groups. Richard & Philippe returned to Dartmouth, so that they could get back to Philippe’s van before the carpark ticket in Brixham ran out. 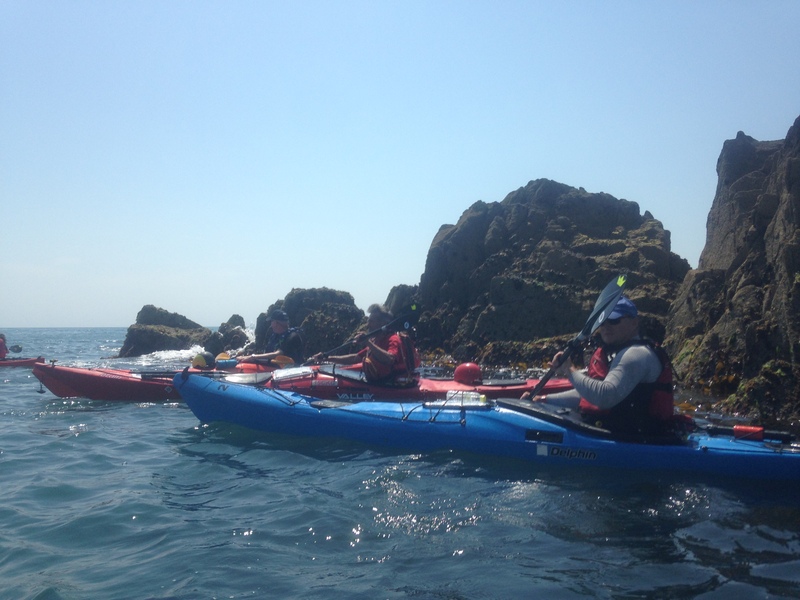 The rest of the group had a leisurely visit to see the seals at Mew Stone and paddle into Dartmouth. Thanks are due to David’s wife and Richard & Philippe for doing the drop off/car shuttle to enable the one-way paddle. In the evening we headed to Start Bay Inn to sample some of its delicious sea food. Sunday morning we woke up to the sound of rain on the tents. Lightening could be seen out to sea, slowing heading inland. Since had had two warm & sunny paddling days, we abandoned plans to do a half day paddle on Sunday, which would have been in solid rain, to preserve memories of our lovely sunny-paddling days! Thanks to Tim, Phil & David from Dartmouth for their welcome, enabling us to use a couple of DYC kayaks and good company on the water.